With Tabbt, you can send money to friends in a matter of seconds. Free, easy, secure and directly from bank account to bank account. It works with your existing bank account and takes less than 30 seconds to set up. Go to your Tabbt app's settings screen and choose "Payment options". You can receive money to any German bank account. Choose a person, tap "Send Money", enter the amount, confirm the payment - done. The transfer is passed for payment to your bank instantly. It usually arrives on the recipient's account the next bank working day. If both sender and receiver use the same bank, your money can arrive almost instantly. Sending and receiving money on Tabbt is completely free. Tabbt has developed a unique security concept that protects your sensitive banking information better than any other payment service. In order to protect your data, Tabbt uses the latest security and encryption standards and is the world's first payment provider to have implemented a "Zero Knowledge" technology. That means: You will have to enter your personal banking information such as your IBAN into the app only on first setup. 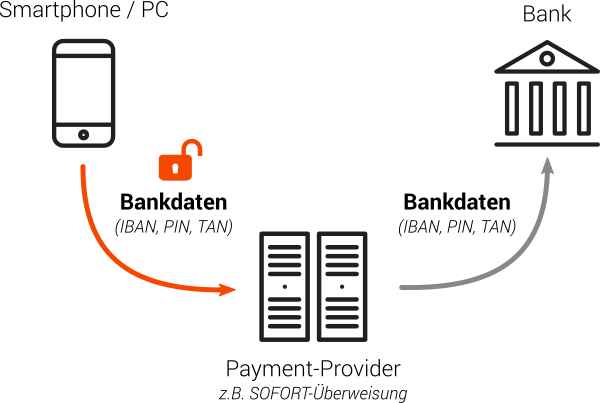 They will always be kept highly encrypted and stored locally on your smartphone – with no exceptions. Banking is one of the most sensitive areas in our lives. That’s why we do not compromise on security. 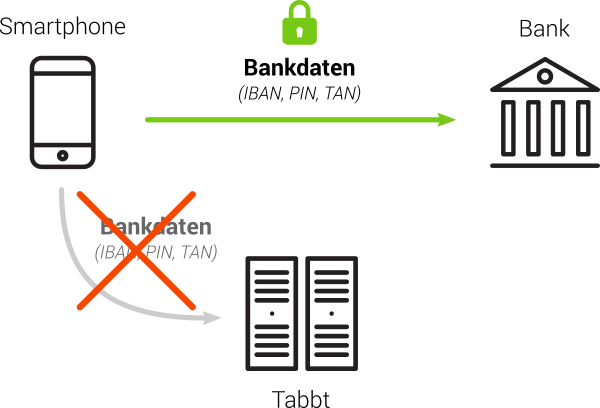 Unlike other payment solutions, the Tabbt app talks directly to your own bank using a highly encrypted connection (see illustration below). Sensitive information like your PIN and TAN are only transmitted to your bank, but never to Tabbt. As a result, you are always in full control of your sensitive data. Your payments are protected by your fingerprint or your Tabbt-PIN. In addition to that, as in your regular online or mobile banking, your bank will always require you to enter a valid TAN to carry out a payment.